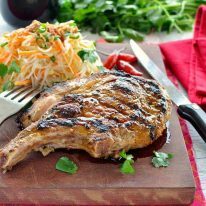 Bring the real flavours of Vietnam into your own backyard with these Vietnamese Pork Chops infused with a simple but incredibly flavourful lemongrass marinade, then seared to perfection on the BBQ. Asian grills are my favourite. If you’ve ever been to any part of Asia, you’ll know that some of the best street food is cooked over charcoal, whether it be Yakitori (chicken skewers) in Japan, Satay Chicken and Suckling Pig in Bali or Gai Yang (Marinated Chicken) in Thailand. And this Vietnamese Pork Chop is right up there with the best of them. The marinade is classic Vietnamese flavours – a perfect balance of salty, sweet, sour and a mild hit of heat. An essential ingredient in the marinade is lemongrass, a herb that is at the heart of Vietnamese cuisine. It has lemon tones but an earthiness to it that is not like any other herb I know. It’s very unique and can turn an ordinary dish into something really special. It cannot be substituted with just lemons – in fact, I can’t think of anything that you can substitute it. This marinade also works very well with beef and chicken, any cut that isn’t too thick so the flavours can infuse into the flesh. 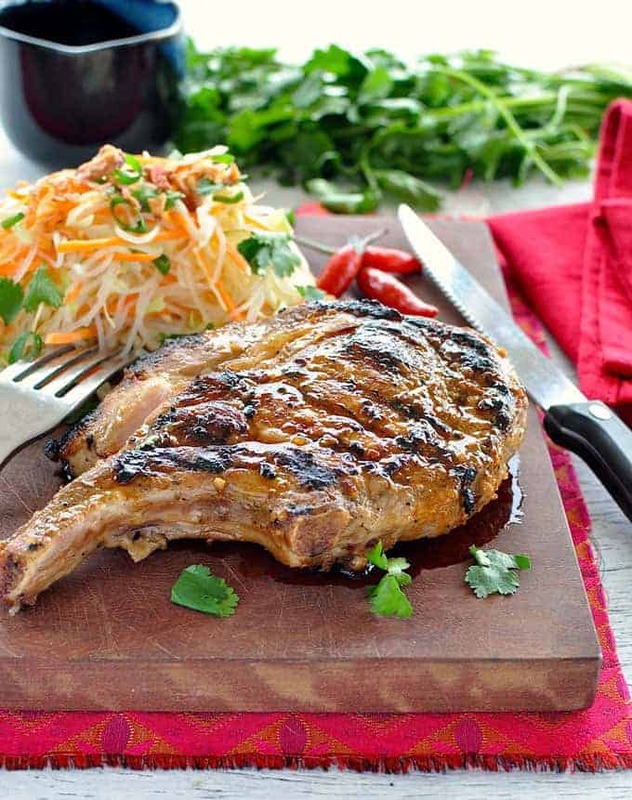 Marinate Vietnamese Pork Chops for a minimum of 4 hours, up to 24 hours. It’s a great recipe to add into your BBQ essentials!! Pork is probably the most widely used meat in Vietnam. This lemongrass marinade is perfect for a pork cutlet to cook on the outdoor grill. Place the Marinade ingredients in a ziplock bag and massage the bag to mix the ingredients. Add pork to the Marinade and massage the bag to coat all the cutlets with the Marinade. Marinate for at least 4 hours, up to 24 hours. Brush the outdoor grill with oil and heat to medium high (or pan on a stove). Remove pork from the marinade. Place pork on the grill and cook each side for 2 minutes, or until cooked (depends on thickness of the cutlets). Remember that it will continue to cook while resting. Remove pork from the grill onto a plate and cover loosely with foil. Rest for 5 minutes before serving. 1. I often freeze the meat with the marinade. Then defrost and bring to room temperature before cooking. Hey, do you think I can use a dry lemongrass here? Hi Ewa, you can – just use 1 tsp of dried. Love to know what you think! Thank you Nagi. Absolutely delicious, was a big hit for the whole family and guests. I dont have lime so i replace with some redwine viniger still taste so good and tender. Will cook again for next party. I’ve made marinades in the past with Lemongrass, but I’ve used frozen lemongrass from the Asian Market. It works well when you have all the other ingredients and you don’t want to make a special trip to the market to get fresh lemongrass. 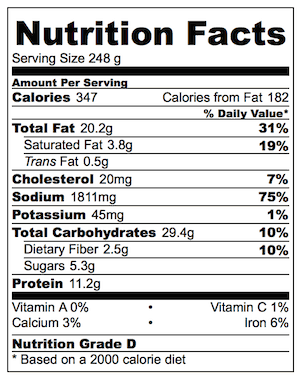 I’m wondering the equivalent to one stalk of lemongrass–is it 1 Tbsb? More? Less? also is there a particular brand or type of fish sauce you recommend? Hi Jacqui! Personally I would use more – about 1.5 tbsp, just because fresh has a stronger flavour 🙂 I don’t have a specific fish sauce I recommend but I usually get the one with the lime green lid 🙂 It’s sold at Coles, Woolies etc in Australia! This recipe sounds amazing but i don’t have a grill. How would you suggest the best way to cook it and how high/long? Baked, stove top grilled? Thanks! Hi Katie! You can cook this on the stove in a skillet, medium high for around 2 to 3 minutes on each side for a cutlet around 1.5cm / 2/3″ thick. 🙂 I don’t recommend baking, you won’t get the lovely caramelisation! Hope you love it! The marinade is classic Vietnamese! This was absolutely delicious.!! Loved the asian noodle salad as well. Extra Pork is freezing with marinade. Have a question about freezing with marinades (perfect for me since husband is picky eater and I often make separate meals). For example with Tandoori chicken, do I freeze immediately or do I let flavors marinate overnight before freezing? We both seem to have Vietnamese food on the brain, lol! 🙂 I love, love, love lemongrass – the taste, the smell, it’s all wonderful! Couple it with that magical animal – the pig, put it on a grill, and you’ve got something really special! This recipe has it all! Agreed! And your nuoc cham would go fabulously with this….well, with anything Vietnamese really!